Months before our trip to Tokyo, my husband started doing some research into restaurants in the city that we might want to dine at while we were in town. We essentially knew we’d only be in the city for one dinner meal during our time in Tokyo and we wanted to make sure that we planned for something spectacular during that one night. Reading through some sort of travel magazine, my husband came up with the name of a restaurant that was supposedly very authentic Japanese, was tiny and definitely required reservations in order to get a seat, and luckily helped foreigners bridge the language barrier via an English menu that you could point at to order food. When I went online to read reviews of this neighborhood restaurant, I was blown away by rave reviews this restaurant received and the food they served sounded to-die-for, so I told my husband I was in and that he needed to figure out how to get us reservations. Fast forward to one month prior to our trip and my husband reached out to the concierge service provided by our credit card company and they were able to secure us reservations to this little gem of a Japanese restaurant. Located in Shibuya, just within walking distance of the Yoyogi-Uehara train station on a small, but restaurant-packed alley, was a gateway, or rather a curtain, into a whole new world of authentic Japanese yakitori at Fuku. There is no sign, no banner, no billboard, or any other indication of what lies behind these curtains. There’s not even a name on the front of the restaurant. Either, you arrive here and you know this is Fuku, or you walk right on by and wonder where in the world the restaurant is and how you could have possibly missed it. 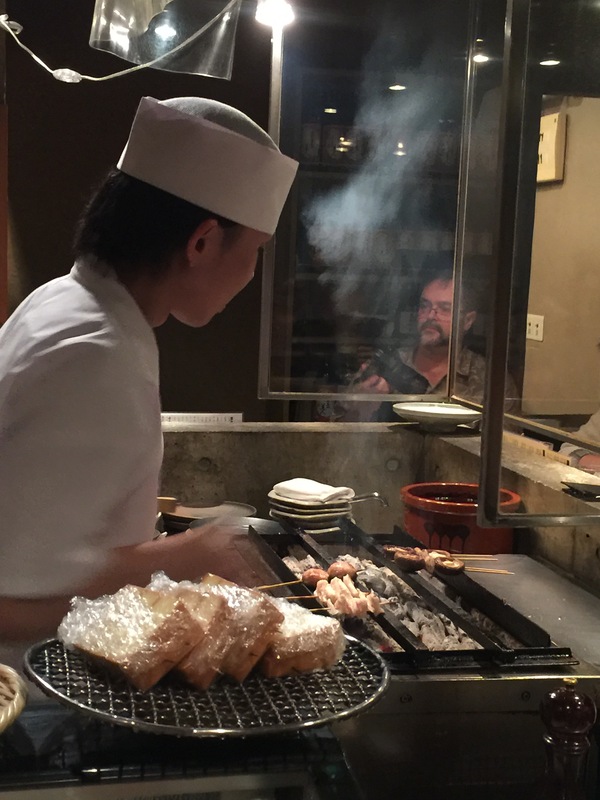 Once you pass through the curtains, you step into a whole different world centered entirely around a yakitori grill. 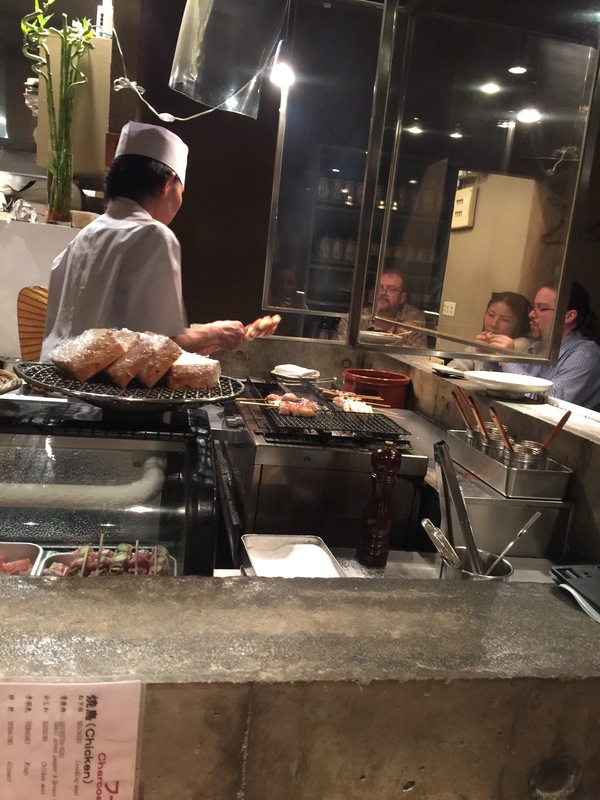 This tiny little space consists of a U-shaped counter with the yakitori grill and the grill master standing in the center of the scene. Around the counter, there was seating for about 14 guests. Around the rest of the room, there were a few tiny tables that probably sat another 10-12 people max. Therefore, you’ve got no more than 25 guests dining at Fuku at any one time, and even at that, the place feels jam packed. The best seats in the house are those at the counter as you can watch the grill master grill up skewer after skewer of various meats and seafood that are being ordered. Luckily, we secured ourselves a seat at the counter to enjoy the show. 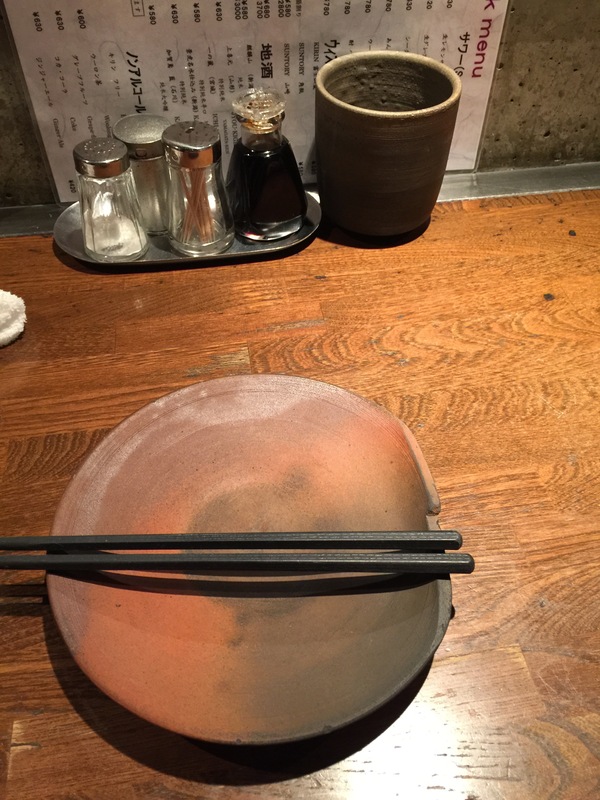 Each seat at the counter consisted of a bar stool to seat yourself at, a hand created clay plate with a notch cut out for your chopsticks, a pair of chopsticks for your use, and a little tray consisting of salt and pepper, toothpicks and soy sauce. And then next to it sat a small clay cup, whose use would become apparent a little later on. Also, there’s a simple, one-page menu, one side in English, one side in Japanese that you use to order from. To start the meal, a hot towel is presented, your order is taken and then you sit back and enjoy as your grill master starts preparing what you’ve ordered. My husband decided to start off his meal of grilled meats and vegetables with some beer. Instead of a local Japanese beer, he spotted a favorite San Francisco beer on the menu that he just couldn’t pass up. Ice cold Anchor Steam in a chilled pint glass is just what the doctor ordered for my husband. 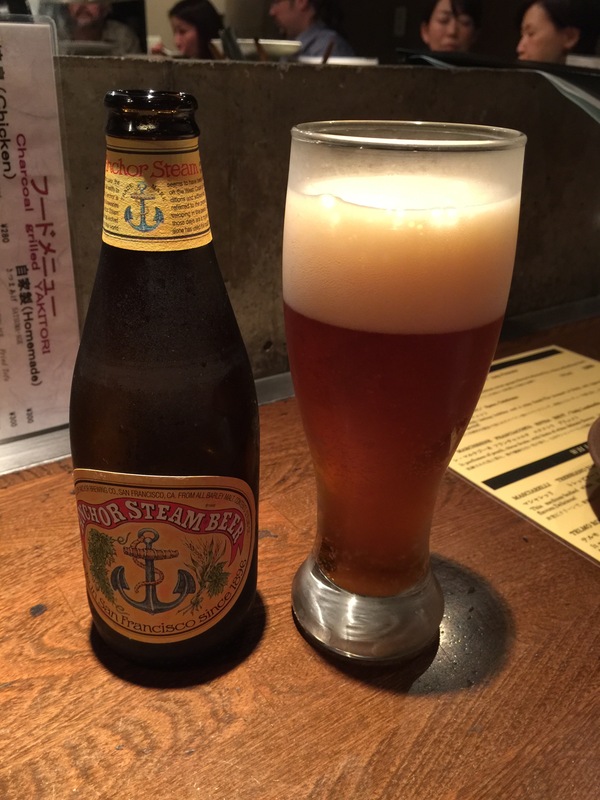 A little thirst quenching brew to pair up with traditional Japanese yakitori. Time to get down to business. 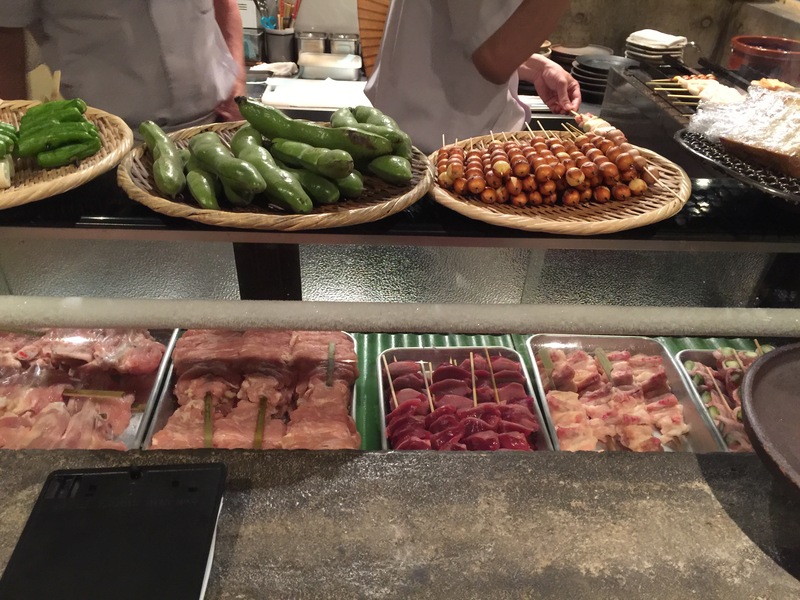 Fuku offers different categories of yakitori: chicken, beef, roll, homemade, seafood and vegetable. Clearly, in looking at their menu, chicken is their speciality as they offer the most variety of chicken skewers utilizing all different parts of the chicken. All of the skewers are prepared in advance and are chilled in a refrigerated case right by the grill. When an order is placed, an assistant lines up the skewers and the grill master starts grilling up each skewer and doctoring it with the right amount of spices and sauces according to how they should be cooked. As soon as each skewer is grilled and completed, it’s delivered from the grill directly to your plate. There is no pretense in presentation as the star is the skewer and it should be enjoyed piping hot from the grill. The idea is that you sit down, order a couple of skewers, enjoy those as they are served to you, and then when your order is complete, order some more based on how hungry you still are. This is the type of restaurant where you sit and enjoy and savor the meal, not power right through it. Besides, half the fun is sitting there watching the grill master as he does his job and then enjoying the fruits of his labor. Looking over the menu, we made a few initial selections so we could sample a couple of different types of skewers. Then we’d figure we’d see how hungry we still were and order more if we wanted to, or try new things if we were that adventurous. 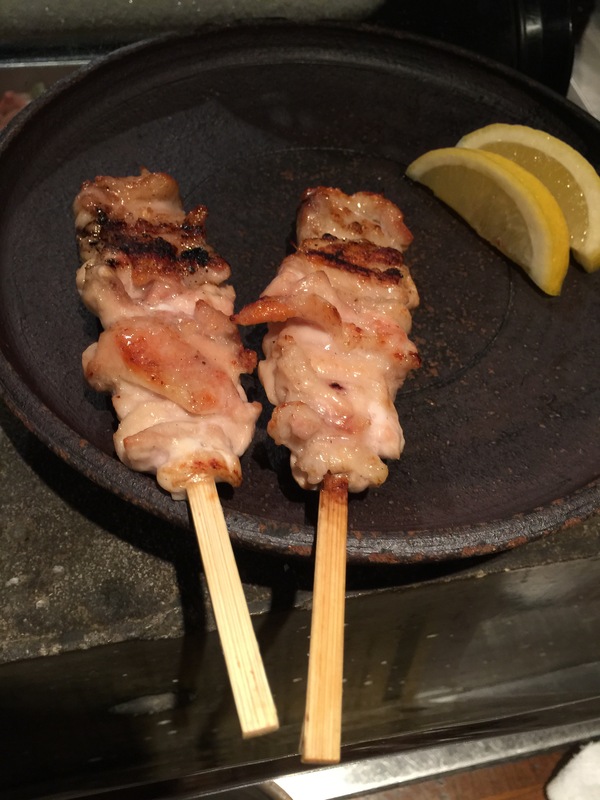 Our first two skewers presented to us were chicken meat. This skewer seemed to be a combination of various chicken meat selections, some white meat and some dark meat consisting of thighs and legs. The chicken was grilled perfectly and seemingly only seasoned with a bit of salt and nothing else. While we had soy sauce at our table and more salt and pepper, we discovered that other than lemon juice on the seafood skewers, none of the other skewers needed any additional flavoring. The flavor of whatever was ordered shined right through in the grilling process and that was all we really needed. There were so many different chicken skewer options, it was hard to know what to order, and as I’m not an adventurous eater, I decided to stick with what I knew I could eat. Other chicken options included wings, gizzard, skin, tail, liver, chicken meatballs, soft chicken cartilage, heart, giblets, and neck. My husband was a little interested in trying some items such as heart and liver, and had he been dining with someone more adventurous than I, probably would have tried them, but since I wasn’t interested, he decided to skip them. We ordered another chicken skewer, which was leek & leg meat. Dark meat chicken skewered in between stalks of leek were absolutely delicious. When the leeks were grilled to the point of being slightly charred on the outside, they were fantastic and really brought out a lot of flavor. The leeks were soft and tender on the inside, and the dark leg meat of the chicken was tender and flavorful. This was a great combination of flavors on a single skewer and my husband and I both enjoyed this chicken skewer. There were also other chicken skewer combinations offered that included items such as shiitake mushroom stuffed with minced chicken meat, chicken meat with horseradish and chicken with plum & perilla. Fuku only offered one beef skewer option which was Australian beef. Being a beef lover, I had to give that a try. The tender beef chunks were skewered with a couple of shishito peppers in between to add a bit of flavor. The beef itself was tender and flavorful, again only being seasoned with a little bit of salt. For my husband, what he loved about this beef skewer was the shishito peppers. I order the skewer for the beef, he could care less about the beef and goes for the peppers, which I don’t even want. I guess it works out because I get what I want and my husband gets what he wants. With the next skewer, I had no idea what it was when I ordered it other than it sounded good. 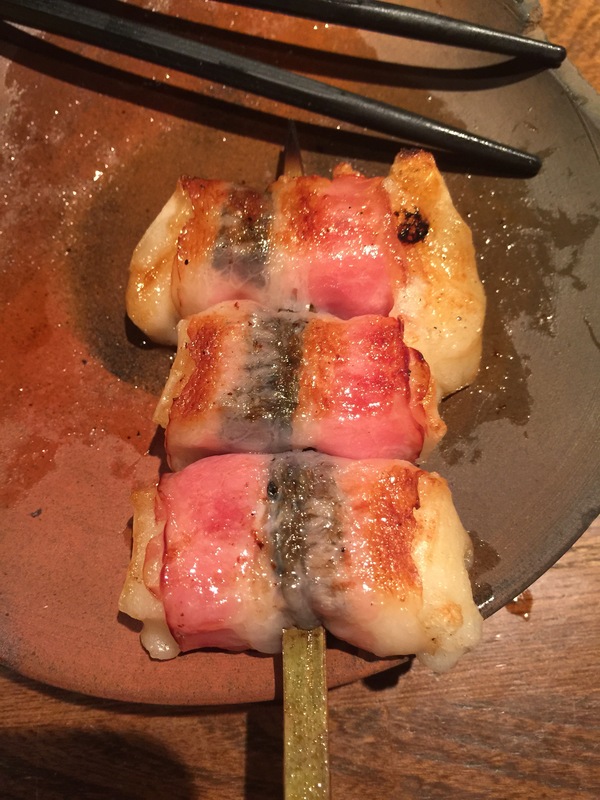 Called moti-bacon, it was described on the menu as being a rice cake rolled in bacon. Come on now, anything rolled in bacon couldn’t be bad, right? And sure enough, on the skewer were three rice cakes rolled in bacon and grilled. However, when I read the description in English, I was thinking rice cake, such as long grained steamed rice rolled into some sort of a ball and then covered in bacon. However, being that this is Japan, I should have realized that the rice cake was actually mochi. For my husband and I, who love mochi, this was great! This ball of mochi which was grilled up and hot, was ooey and gooey and tasted amazing grilled. The bacon added the perfect amount of saltiness and char grilled flavor to the rice cake. This was a terrific combination and a smart way to add flavor via bacon into something such as mochi which traditionally is pretty flavorless. We didn’t want to order nothing but meat skewers, so we made a couple of choices off of the vegetable skewer list as well. As I’m a huge fan of onions, I ordered the petit onion skewer. 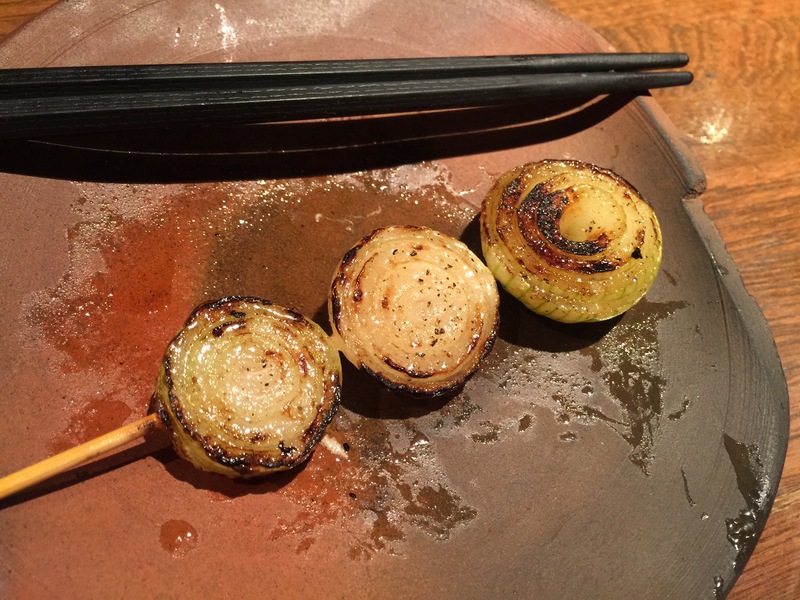 These small, sweet onions were so delicious and tasty all grilled up. The grill added the perfect amount of caramelization to the onions to make it just the perfect amount of sweet. These were good on their own or to enjoy with the grilled meat. I enjoyed the petit onions so much that I ended up ordering a second skewer of onions. Another unusual grilled skewer item we saw on the menu that we couldn’t pass up was smoke cheese. We had absolutely no idea what this meant, and how could you put cheese on a skewer and grill it, how would that work? Well, we were about to find out. Sure enough, on a double skewer set up, three thick slices of cheese were grilled up to perfect so that they were blistered on the outside and soft on the inside. 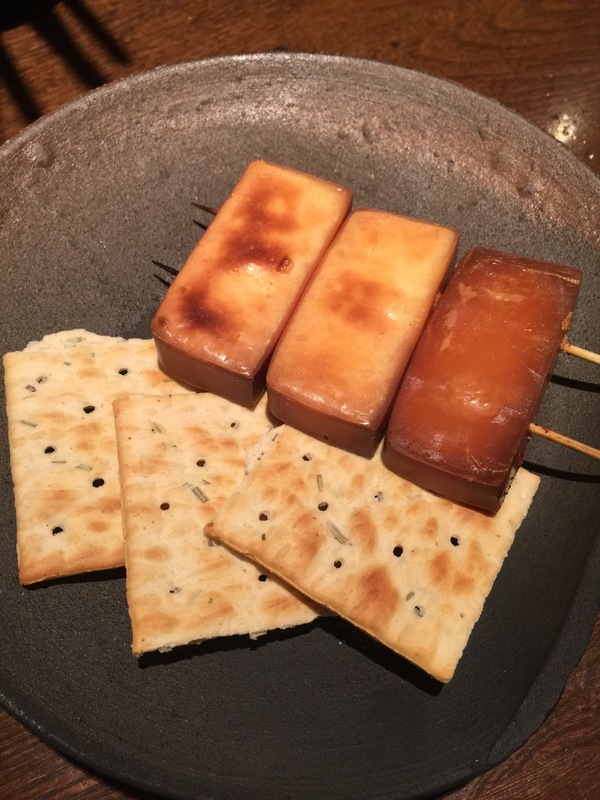 Served up alongside the smoked cheese were three herbed crackers with the idea being that the grilled smoked cheese was to be taken off the skewer and eaten atop the herbed crackers. Oh man was this smoked cheese incredibly delicious. We weren’t sure what kind of cheese this actually was, but the smoke flavor of the cheese really shined through via grilling. The outside was bubbly and blistery creating a nice waxy outer skin on the cheese. Once you bit into the cheese, the inside was soft and slightly gooey with a very mild flavor. The herbed crackers were perfect because they added a little bit of saltiness and herb flavor to the smoky mild cheese. 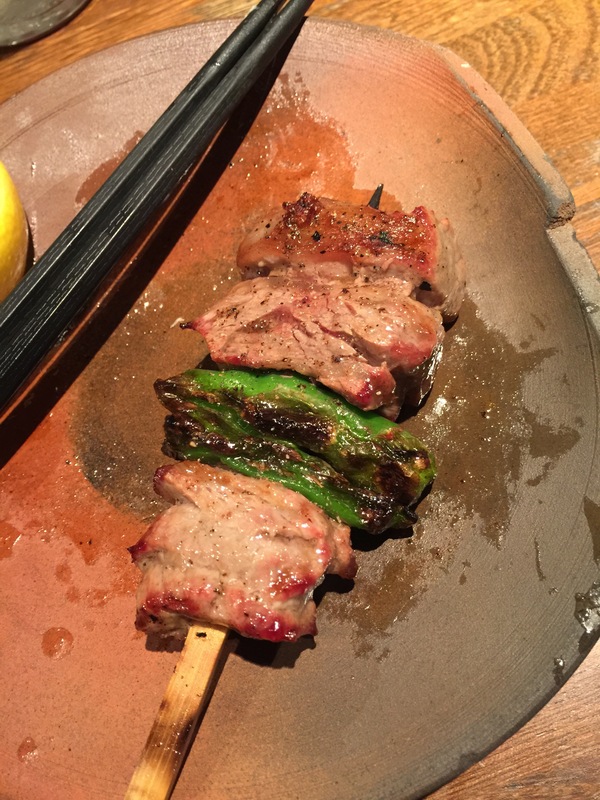 It was such an unusual combination, one we weren’t expected to see grilled on a skewer, but somehow, it was just so perfect and tasted amazing! Of course, we wanted to order some seafood skewers as well. One of the options was salmon, which is one of my favorite types of fish. 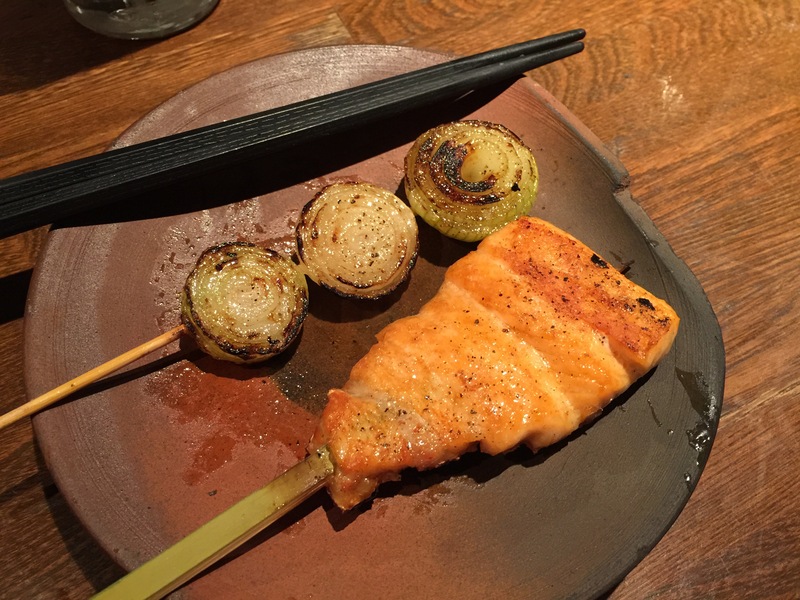 With the salmon skewer, you get a couple of pieces of salmon filet on the skewer that is grilled up, again to perfect. The salmon skin remains on one side and is grilled to the perfect crispiness with the meat of the salmon perfectly tender and flaky. Grilled salmon is generally delicious and somehow in this setting, the grilled salmon tastes that much better. I thought that salmon was the perfect protein to skewer and lending itself so well to being grilled. 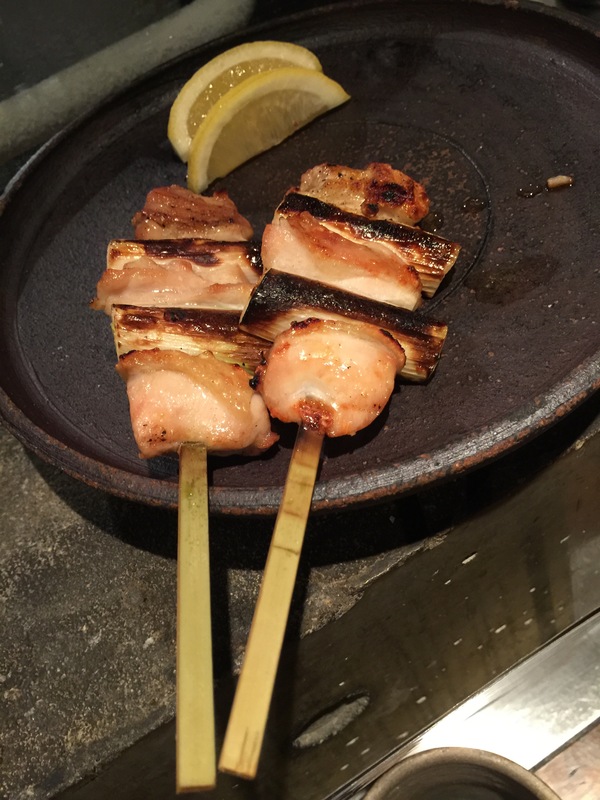 I enjoyed the grilled salmon skewer so much I ended up ordering a second skewer just for myself. After having the shishito peppers grilled up with the Australian beef skewer, my husband enjoyed it so much he decided to order a skewer of just shishito peppers. This was all for him as I’m not a shishito pepper fan, or any sort of pepper fan, for that matter. This made my husband happy as he was more than happy to eat all of the shishito peppers. In fact, at the end of the night, out of all of the skewers we enjoyed, this is the one that he liked the most because he thought it was the most unexpected. The blistered and charred peppers were delicious all grilled up with just a little bit of heat behind them. The sauce that was drizzled over the peppers was amazing and just added the right touch of flavor to the dish. My husband has mentioned multiple times since we’ve been home that he wished that he knew had to make shishito peppers the way he had them at Fuku because that flavor has become one of his favorite flavors. I heard the group of Dutch tourists sitting at the counter next to us ordering a special seafood skewer that wasn’t on the menu, and when it was delivered to their plates, it looked so amazing. I decided, I needed to try one of these skewers for myself. The special seafood skewer was scallops and onions. Two scallops were pillowed by onions to add a bit of sweetness and flavor. The scallops were delicious, tender and sweet. I’ve always liked scallops, but never buy them to cook at home because there’s a fine line with scallops between perfectly cooking them until they are tender and over-cooking them to the point where they are tough. 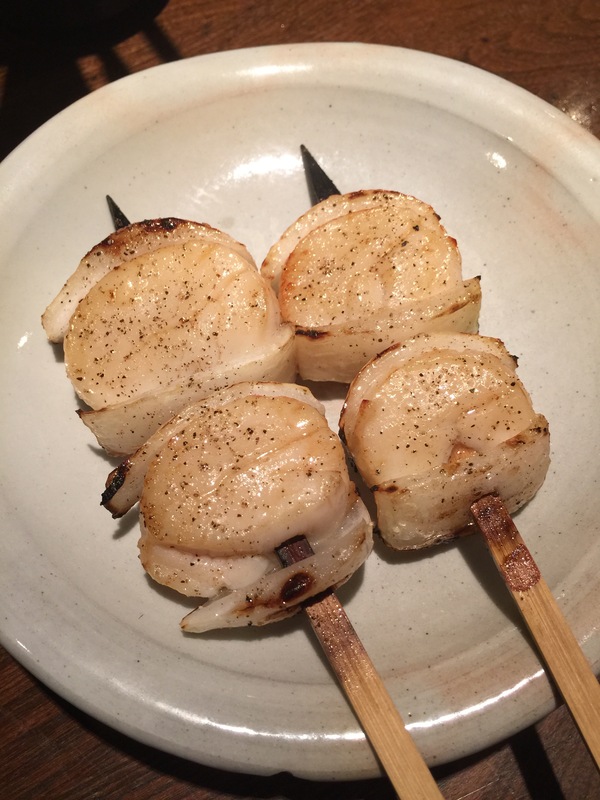 At Fuku, these scallop skewers were delicious and the grill master proved his skill by grilling the scallop to the perfect tenderness. The scallops were tender and soft and absolutely delicious. The onions added sweetness and crunch to the soft scallops. My husband knew how much I enjoyed the scallops that he gave me half of his skewer. 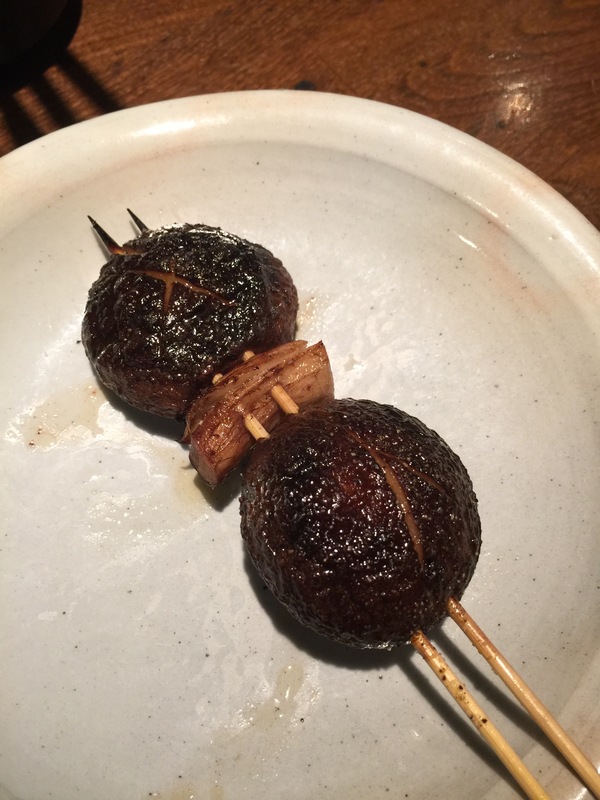 Finally, the last skewer we ordered was another one just for my husband, shiitake mushroom skewer. I am not a mushroom fan, so I told him this skewer was all him. He was more than happy to take the skewer. After all, it was grilled shiitake mushrooms, what more could he want? He said that the mushrooms were perfectly grilled to bring out a little char flavor and a lot of sweetness and earthiness in the mushrooms. If he weren’t so full, he probably could have gone for another mushroom and another shishito pepper skewer. It was amazing how putting some protein or vegetables on a wooden skewer, seasoning them lightly and grilling the over a yakitori grill could completely transform a dish from something simple and bland to amazing and tasty. 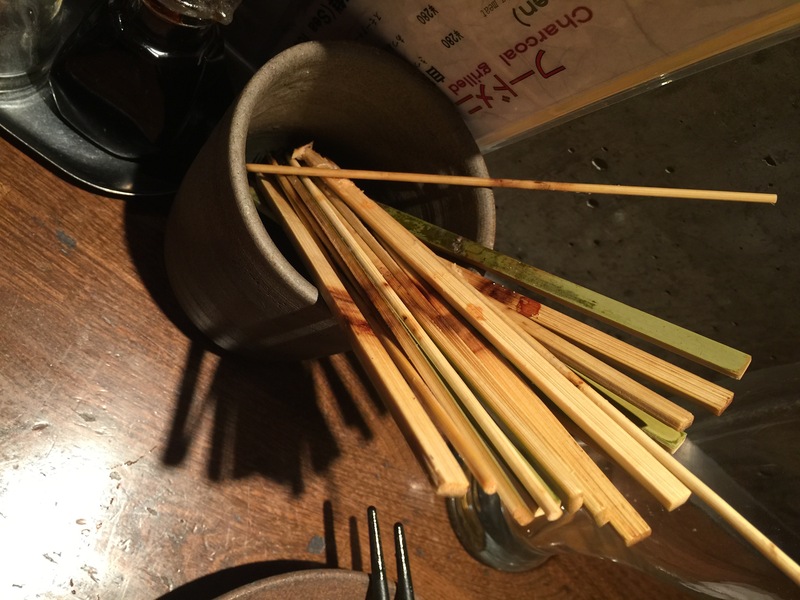 The clay cup that sits at the counter when you sit down at your seat is for your used to hold your discarded skewers once your finished with each skewer that’s presented to you. By the end of the night when you’re ready to call it quits, its amazing to look at the cup and realize just how many skewers you’ve eaten. You don’t even realize how filling these skewers are! When my husband and I got off the train at the station and started walking towards Fuku, we didn’t know what to expect. 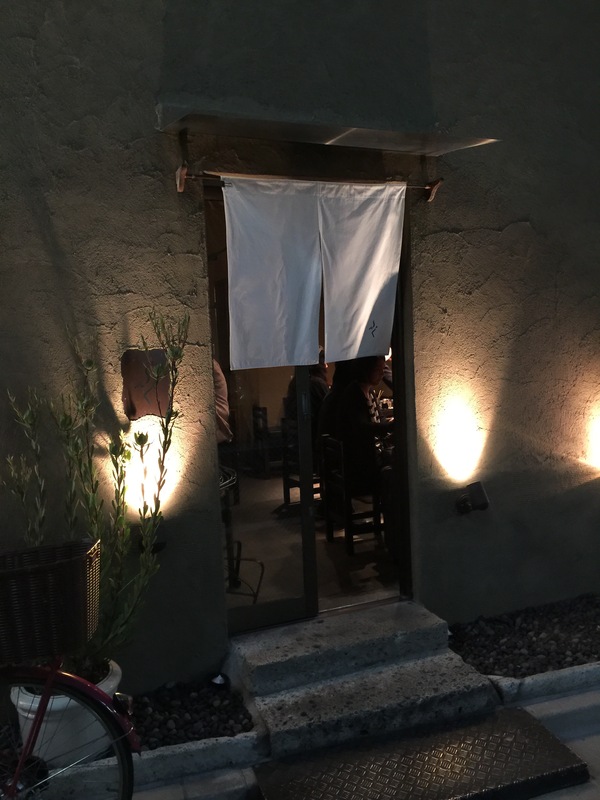 When we arrived at the restaurant and were greeted by a classic Japanese scene of the restaurant behind the white curtain, we knew we were stepping into a whole new experience. 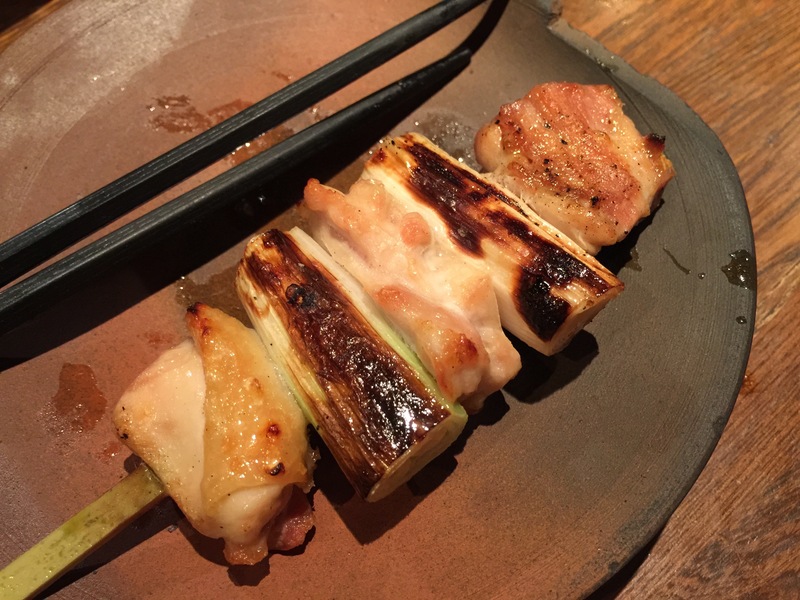 What we got was an authentic Japanese yakitori experience and it was unbelievable. From the moment we sat down, it was like we were treated to a show. A true grill master churning out, or rather grilling up, some of the tastiest meat and vegetable on a stick I’ve ever had. Watching the grill master at work was a great experience. But, what topped all of that was how amazingly delicious each and every grilled skewer we enjoyed for dinner was. 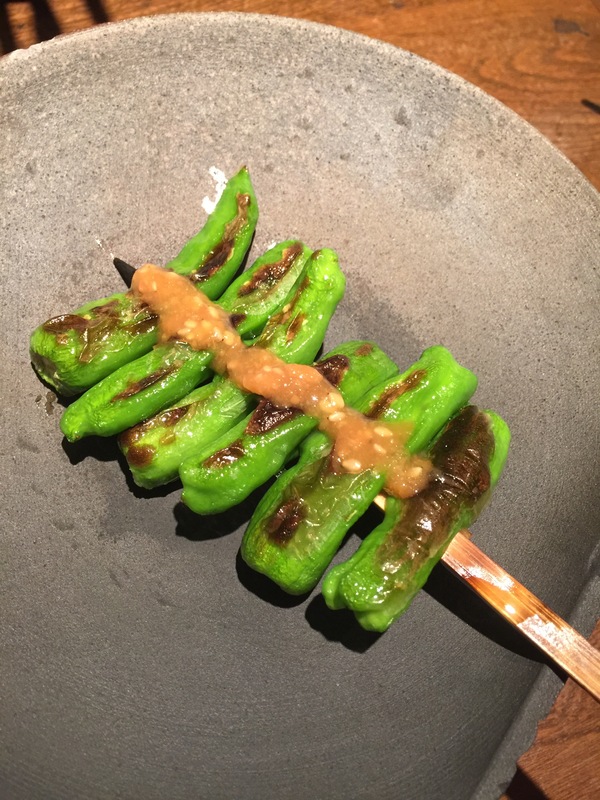 My husband and I were looking for an authentic Japanese dining experience, and what we got at Fuku was better than we could have ever imagined it to be. The food was amazing, the atmosphere was amazing and we both walked out of their saying that we would come back to Fuku in a heartbeat the next time we were in Tokyo. I’d never hesitate for a second to recommend Fuku to anyone going to Tokyo, that is, if you can even get a reservation!